So I promised at the end of the last post I’d tell you my best Buddhist book for the year; thinking over the problematic triple-genre of Buddhist books made it clear that one of them succeeded at all three tasks in interesting ways. 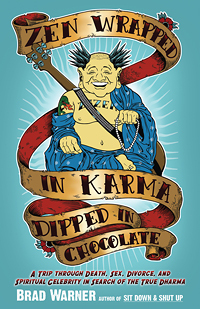 Brad Warner’s book Zen Wrapped in Karma Dipped in Chocolate surprised me. In part, because it didn’t seem to be as controversial as his other books. Maybe I missed something. But it was his most radical statement on the way Buddhist practice shaped his life–and best of all, it works in surprising ways. As I referred in the last post, sometimes the Buddhist narrative seems like Amazing Grace with the subject changed: “Amazing Dharma, how sweet the sound that saved a wretch like me.” Wretchedness to sweetness. Warner’s story takes surprising turns and we see that he didn’t let all the wretchedness go, and he knows it. It’s not about being saved by Buddhism; it’s about letting go of the belief that a change in belief will make everything perfect. As a memoir, it’s a rewarding read. As an argument, it’s extremely thought-provoking. I don’t agree with all of Warner’s conclusions, but I’m glad he’s working with the question. He pulls back the cover a little on Buddhist organizations and shows that, even in communities that are searching for enlightenment, there are still politics, and still interpersonal wrangling, and that’s not going to go away. His vision for the future of Buddhist organizations is well considered, and it will be interesting to see how it plays out in practice over the coming years. So, the last questions is whether it’s a helpful book. It’s not trying to be a self-help book exactly, and someone looking for checklists on ethical or meditation practice will probably do best to look elsewhere. But perhaps it’s helpful to take Warner’s worldview seriously, not for his sake but for your own sake. It’s a how-to guide for people who have started to get overwhelmed by the “-ism” of Buddhism–the organizations, the businesses, the magazines, the Tibetan craft shops, and the charismatic smiling teachers who bring them all together. The “Buddh-” part, if it’s working, will help us see through the “-ism,” and by unveiling many of his own flaws and struggles, Warner paints a better picture for us. So that’s my vote: Best Buddhist Book (I read) is Zen Wrapped in Karma Dipped in Chocolate by Brad Warner.